I have been feeling flattered that a friend across the country asked me to come and be quizzed by her reading group about my book, Unseen Unsung. This was published in 2008, so last week I started re-reading it. I was quite shaken by some aspects of the prose; too dense in parts, too many scene changes. I think if I hadn’t written it myself, I might have had trouble following the plot. I became puzzled, people I don’t know (as well as family and friends) have told me how much they enjoyed this story. Apart from one moment, when I forgot I had written it and the story brought me close to tears, I felt that this was not a book I would recommend to friends. One outcome of this re-reading was an increased confidence in my new book, Border Line, endlessly revised and now going out to agents. Then, last night, I received an email from another writer – an old and trusted friend. She had been reading my most recent draft and she felt that the majority of my revisions were a disappointment and that I had thrown out what was best and unique about my writing. Tomorrow night I will travel across the country to find out what a group of strangers made of Unseen Unsung. On Monday I will look at Border Line again and see if I can distil and replace the missing spirit. Meanwhile Autumn is quietly going about its inevitable and beautiful business. 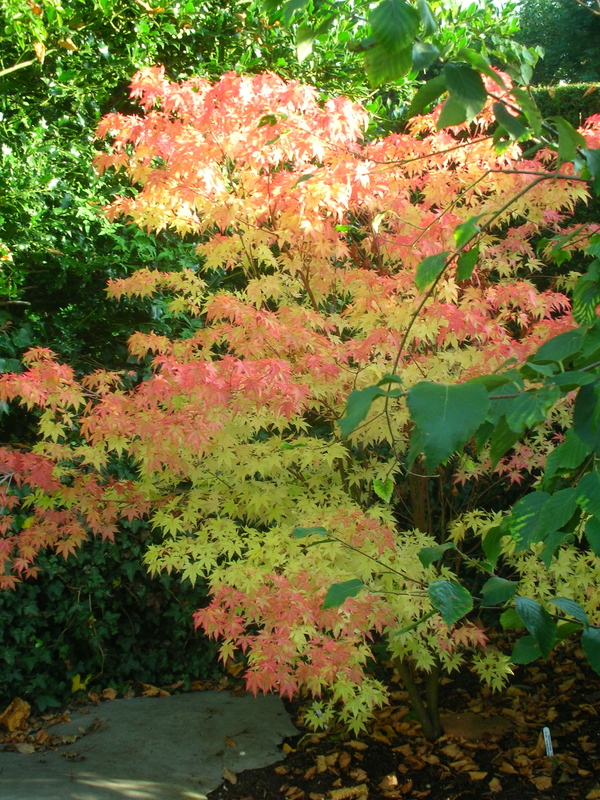 This entry was posted in Gardens, Writing notes and tagged Acer palmatum Sango-kaku, autumn, book groups, border line, Unseen Unsung, writing by hilarycustancegreen. Bookmark the permalink. It occurs to me that, in the past, writers were not in the habit of seeking opinions for works in progress, though they might have received some if the novel were serialised in a magazine. Some people say they benefit from it, and ‘crowdsource’ their work with a view to improvement. On the other hand, this process could easily lead to the writer ending up in two minds at least, which may not be a good idea. I think of Anton Bruckner, so easily undermined by the opinion of others. Which version of the 3rd symphony will we play tonight? How much will we cut from this evening’s performance of the 8th? My opinion, for what it is worth, is that the writer should trust his/her instincts. Best of luck – although I know you won’t need it. All will be great!